If you're new to the idea of raclette, allow us to introduce you ...because you're going to love it! Inviting friends over to share the joy of raclette cooking is a time honoured tradition in Switzerland, and the idea is rapidly spreading around the rest of the world. And why not? Sharing stories over drinks while creating personalized dishes is an activity everyone will love. And you'll be cooking with your friends, not for them. 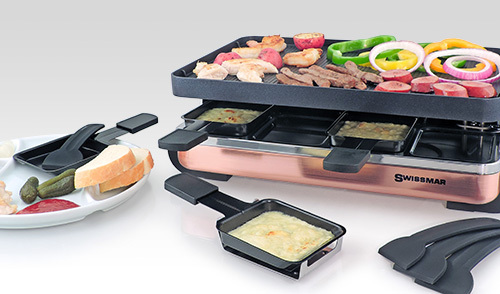 The Swissmar Raclette Party Grill is heated by a 1200-1450 watt element (varies by model), which simultaneously cooks the food on the top grill, and melts cheese on the trays below. The grill is incredibly simple to use...and very quick to clean. Getting started is as easy as taking it out of the box and plugging it in. You'll have delicious plates of food for you and your guests to enjoy before you know it! The Original Raclette... Unmistakably Swissmar! In 1985 Swissmar first began importing Swiss raclettes into North America. With the tenacious determination to perfect this appliance to ensure it met the standards of our customers, a Swissmar brand raclette was created. New and ingenious features such as; non-stick cooking surfaces; dual function grill top combined with crepe top; interchangeable granite stone; non-stick dishes with heat safe handles; temperature controls; and more; Swissmar has set the standard for raclette appliances. The point of difference is in our solid sturdy designs and new line of raclette accessories. When you think raclette, think Swissmar!